This summer, Formlabs hosted The Digital Factory, a conference about digital manufacturing, at the MIT Media Lab. We expected hundreds of guests, and a mass-produced 3D printed part seemed like an appropriate souvenir. Since most of the attendees were already familiar with the 3D printing process, an aesthetically pleasing paperweight wasn’t going to cut it. We needed something that was useful, memorable, and on theme. We decided to remix a commonly mass-produced part, and the Bic Cristal pen’s iconic design and small size made it the perfect candidate. 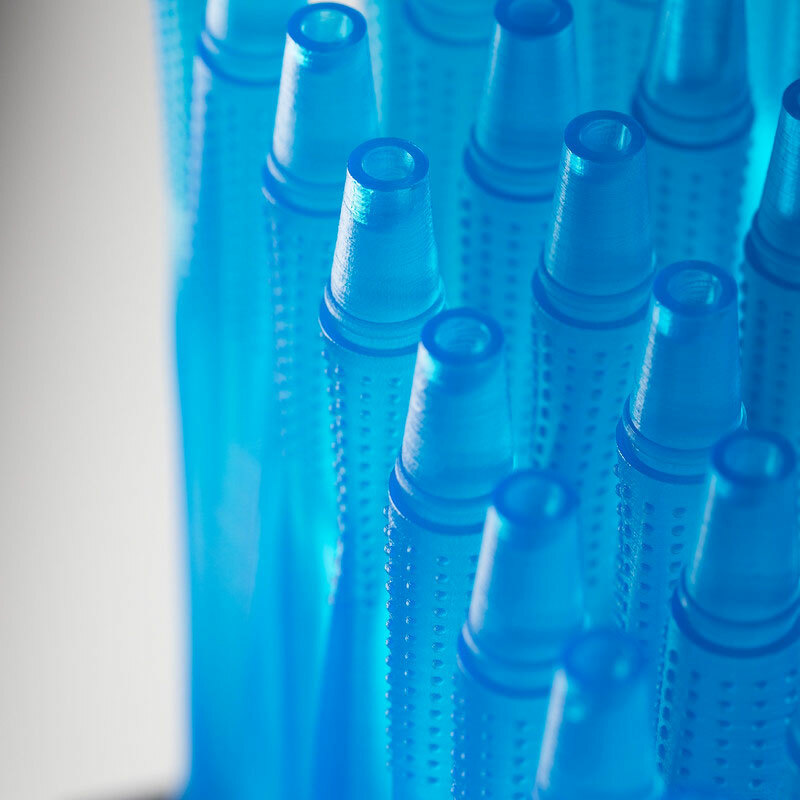 Although sometimes overlooked, the Bic Cristal is an iconic piece of industrial design. It is the best-selling pen in the world, and has earned a place in the permanent collection of the Museum of Modern Art in New York. Although highly utilitarian, the pen’s design doesn’t account for the variety of ways that people grip their writing instruments. 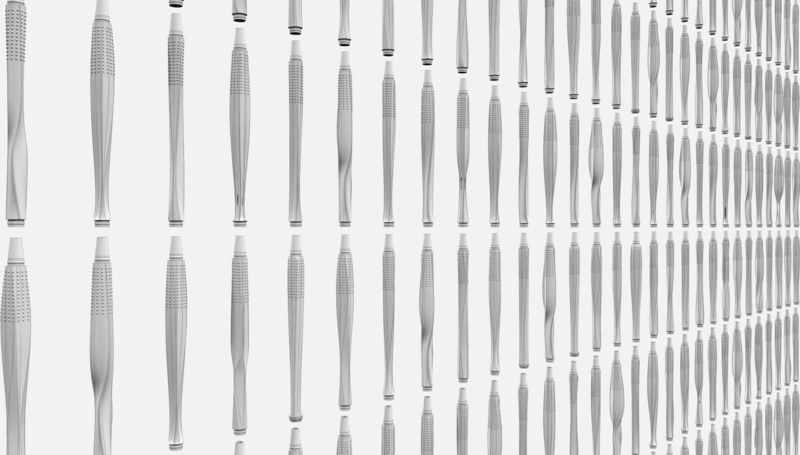 Since the digital factory of the future promises mass customization at no extra cost, we decided to parametrically generate a few hundred design options so each attendee could leave with a one-of-a-kind pen. The pens were designed with an eye toward a future where everyday objects are customized for individual users. 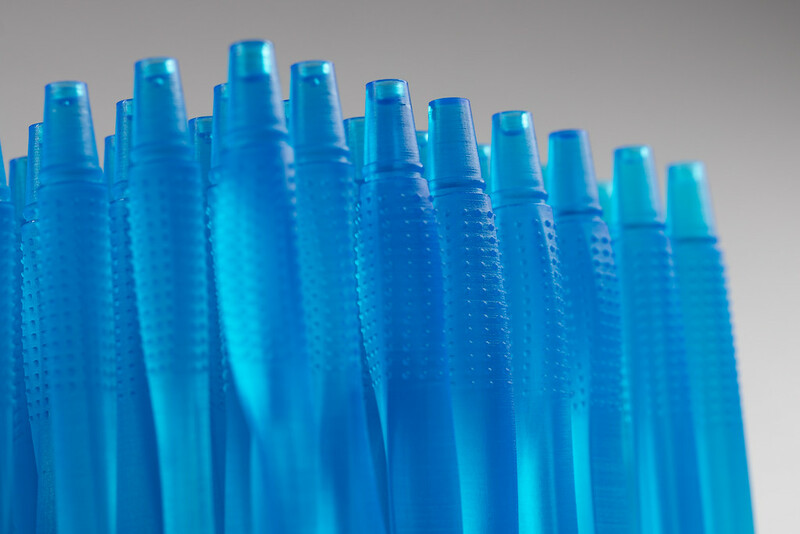 The Bic Cristal is an iconic piece of industrial design and the best-selling pen in the world. Photo: Carlos Delgado, via Wikimedia Commons. We decided to parametrically generate a few hundred design options so each conference attendee could leave with a one-of-a-kind pen. As a company that can receive up to 600 requests for 3D printing samples from our machines each week, we already have a production facility to produce large amounts of parts. We had to seamlessly fit the production of these pens into this system, from file creation to packaging. 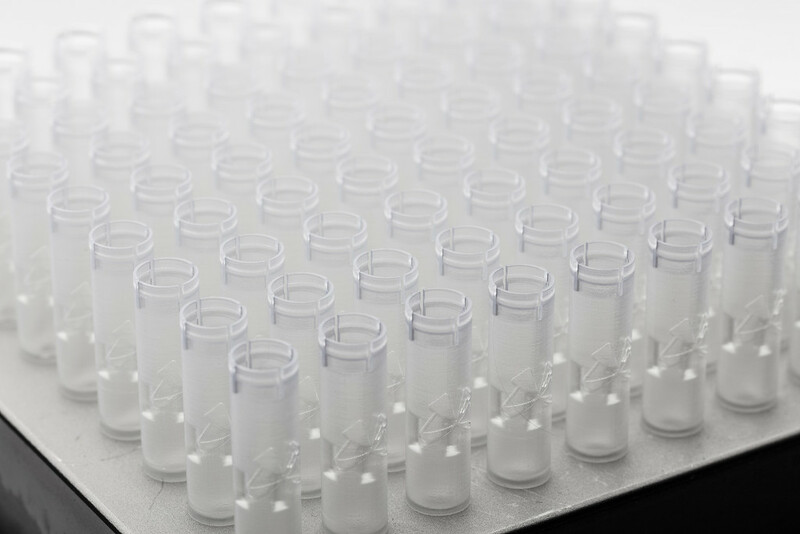 We knew from experience designing other sample parts for mass production that the files needed to be easy to print in stereolithography (SLA), clean, and assemble. We had to seamlessly fit the production of these pens into our existing print production system, from file creation to packaging. Both the caps and pens printed directly on the build platform without the need for support material. Printing the cap face up would have created a closed volume. 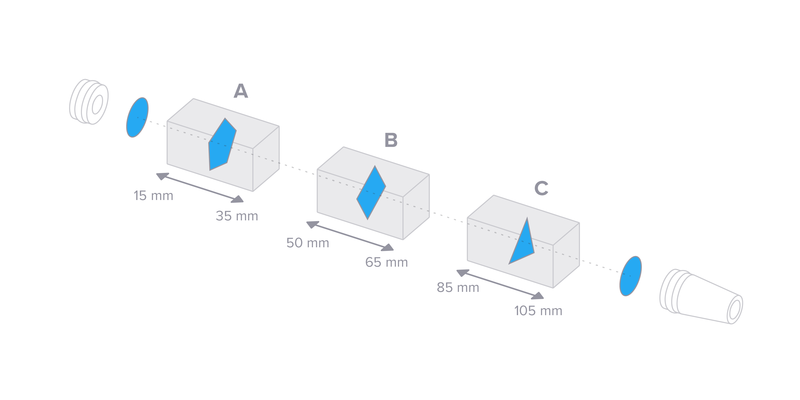 Closed volumes can create a suction effect or vacuum during printing, which can increase the peel forces on the part and lead to print failures such as layer separation or warping. When printing directly on the build platform, the first few layers would be exposed to multiple laser passes in order to adhere to the build platform. This overexposure would lead to slight dimensional inaccuracy in the part, which was unacceptable for a cap that needed a snap fit design. We oriented the caps upside down during printing to mitigate potential print issues. 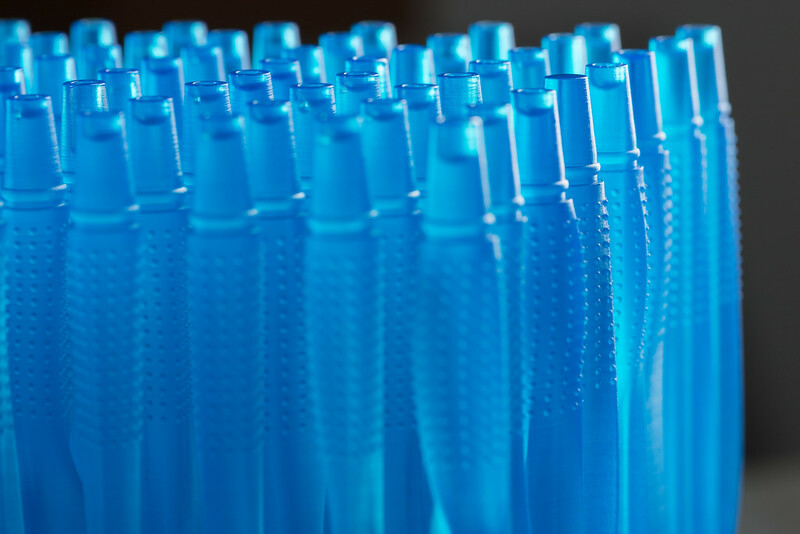 The long, thin shape of the pen enclosures allowed us to print 700 pens on seven printers. We needed to optimize the print not only for quantity, but also to minimize printer downtime. Tall prints that pack nicely into the build volume are a favorite of the print production team, since many parts can be produced with minimal changeover. With a print production facility that’s only staffed during work hours, prints that last between 16-20 hours are ideal. They only need one changeover per day, and the printer is never left idle. Tall prints usually take longer, since the time consuming peel cycle count directly corresponds to layer count. The pens are 1340 layers high and hence take complete advantage of this fact. We were able to print about 700 pens overnight on seven printers, with each print lasting between 18-20 hours. The pen body was hollow throughout, which made it easy to remove trapped resin after printing and trapped IPA after washing. The relatively small surface area in contact with the build platform meant that it was possible to simply pluck the pens off. 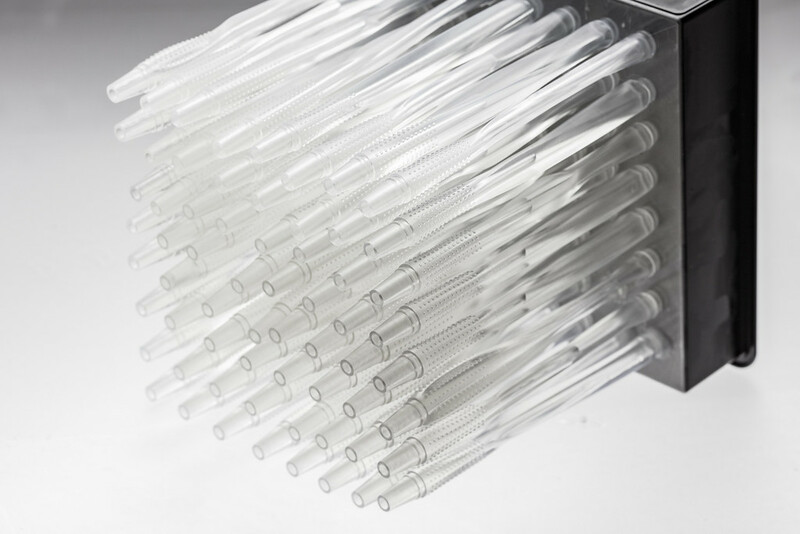 The pens’ hollow body and small surface area in contact with the build platform made post-processing simple. The pen enclosure was designed to accommodate a conventional Bic refill, partially as a homage to the iconic pen and to allow people to easily print and assemble their own pens. The Bic refill can simply be inserted through the top and press fit into the printed enclosure, without the need for any adhesives. 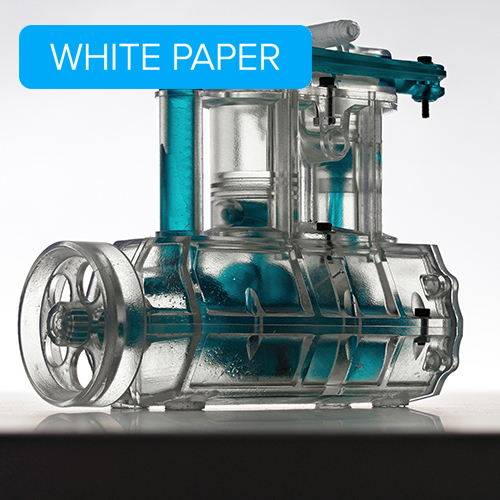 Learn how to optimize 3D printed assemblies for proper tolerance and fit in our white paper. For the sake of internal organization, we came up with a naming system that exported each generated pen into one of six groups (A through F), with each group comprised of 100 pens. This made it easier to move from a directory full of STL files to our PreForm software. Since the pens were meant to be giveaways, we did not label the pens themselves with a serial number. In hindsight, naming each pen would have enabled us to reprint a particular design if it were in higher demand. Learn how to create your own in-house facility for rapid prototyping and low-volume production in our white paper about managing multiple 3D printers. The pen enclosure is essentially a surface lofted over three regular polygons with varying properties. The radius of the polygon’s outer bounding circle. The number of sides on the polygon. The position of the polygons along the length of the pen. The rotation angle of the polygon in its own plane. For the third parameter, we varied the position of polygons along the length of the pen. The total length of the tube is 115 mm, with two circles of a 8.1 mm radius on either end. These gaps in between the polygon ranges ensure that the loft does not lead to sudden drastic twists and turns, which might lead to undesirable intersecting surfaces. These simple parameters allow for upwards of 1 million combinations. The quality control process involves manually looking for print defects such as rashing and blowouts. Since this is a fairly labor intensive process, it made sense to take additional precautions in the CAD stage so as to minimize time spent on manual quality control. A fair amount of additional constraints were added to to the original script in order to iron out broken models, such as surfaces where the loft was twisting too much too fast, or going from too thick to too thin. The Loft command in Rhino is rather complex: it divides the input curves into a certain quantity of points, interpolates them, sweeps surfaces between these curves, and ultimately joins them. The last step can easily go wrong and could lead to the creation of self-intersecting surfaces and non-watertight geometry. Most failure modes were ironed out by this stage, but some lofts bulged outwards drastically, leaving unsupported overhangs. Although they made for some interesting looking designs, they would have required support material to print successfully. Since avoiding support structures was a non-negotiable constraint for this project, we relied on PreForm’s slicer tool for one last check up before sending the file to the Form 2. The slicer is a PreForm tool that turns an STL file into a set of bitmaps representing individual layers, which can help diagnose potential print failures. PreForm is Formlabs’ free software that helps prepare models before printing, including tools that help you x, y, slice. Download PreForm and upload an STL or OBJ file to try it out for yourself. Ergonomics play a large role in the way we interact with the world–our refrigerators, cars, and cameras are all the result of thoughtful industrial design and iteration responding to the constraints of the human body. Writing is a fundamental skill, and teaching it correctly can save a child a lifetime of needlessly uncomfortable, inefficient, and messy writing. The primary factors that affect writing technique are the position of the paper, the position of the arm and wrist, and the grip on the writing instrument. The grip on the writing instrument itself is one of the primary factors affecting writing technique. A Mont Blanc pen is precisely weighted so that it bears down on the paper as the user writes, and a Japanese bamboo pen’s carefully carved nib allows the user to achieve the perfect range of line weights. Thicker pens are usually better for people with arthritis, and pens with triangular cross-sections are conducive to writing with a “tripod” grip. For this project, the design parameters were randomized to produce a large range of options. In the future, we could manipulate the same parameters with specific design constraints to come up with more targeted solutions. The way someone grips a pen is integral to developing good writing habits, and this is where custom 3D printed pen enclosures or grips could be very useful. We’ve uploaded a gallery of 10 hand-picked pen designs. 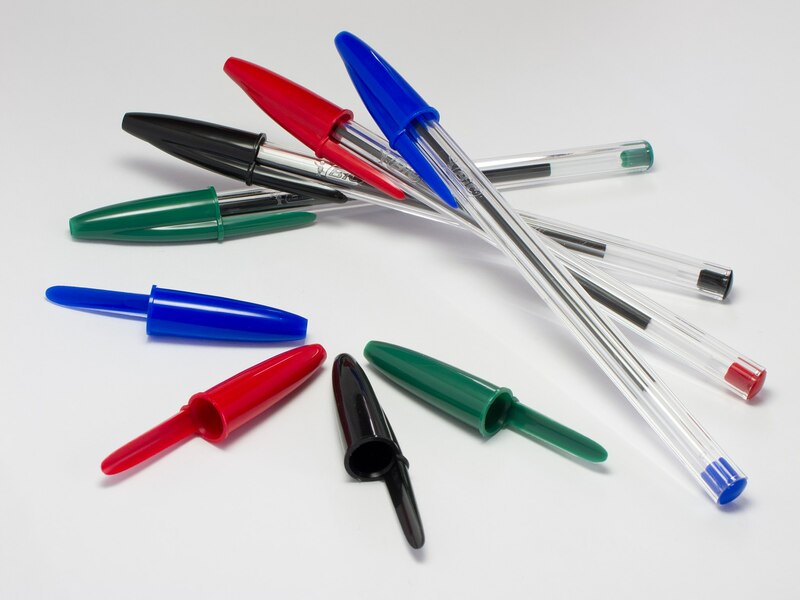 Visit Pinshape to find everything you need to generate and print your own pens. When breaking down cost per part in production, there are three main components that figure into the equation: equipment, materials, and labor. At The Digital Factory, Formlabs displayed the Form Cell, a scalable array of 3D printers that automates repetitive 3D printing processes. Form Cell reduces labor costs to drastically reduce cost per part and make 3D printing viable for production.